See how Nile Air responded to booking abandonment and increased online sales by more than 15%. Booking abandonment is a huge challenge for the airline industry, with SaleCycle’s latest figures showing that more than 80% of visitors will leave a site without completing their booking. Companies like Nile Air attract thousands of website visitors every month, so this equates to a massive amount of potential revenue left on the table. 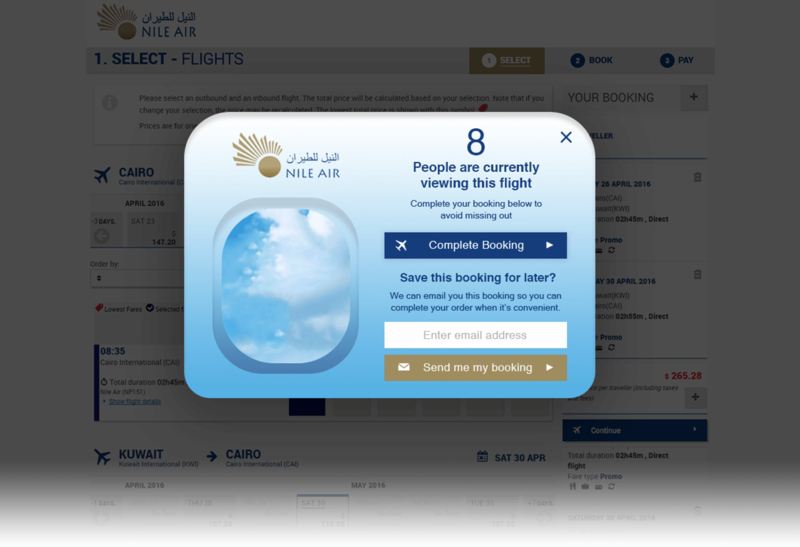 Nile Air identified this challenge and approached SaleCycle to create an integrated On-Site and Email Remarketing program to help convert more of their web visitors into customers. 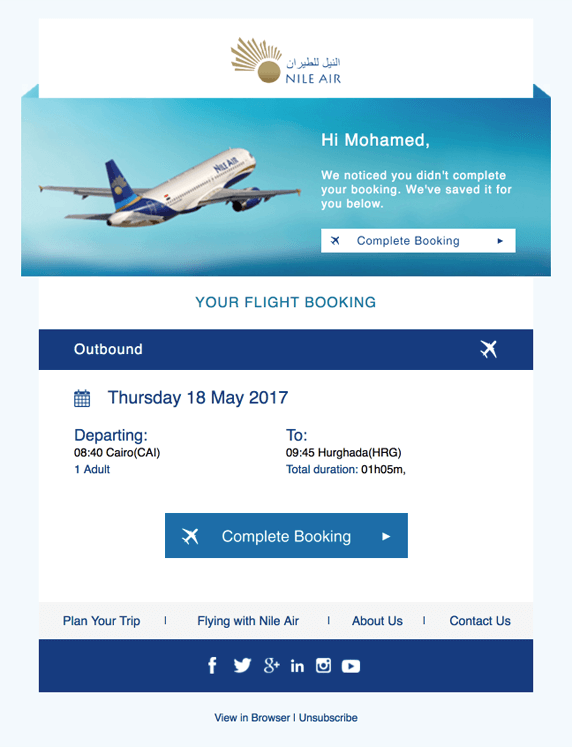 Nile Air partnered with SaleCycle to develop an intelligent cross-channel remarketing campaign. 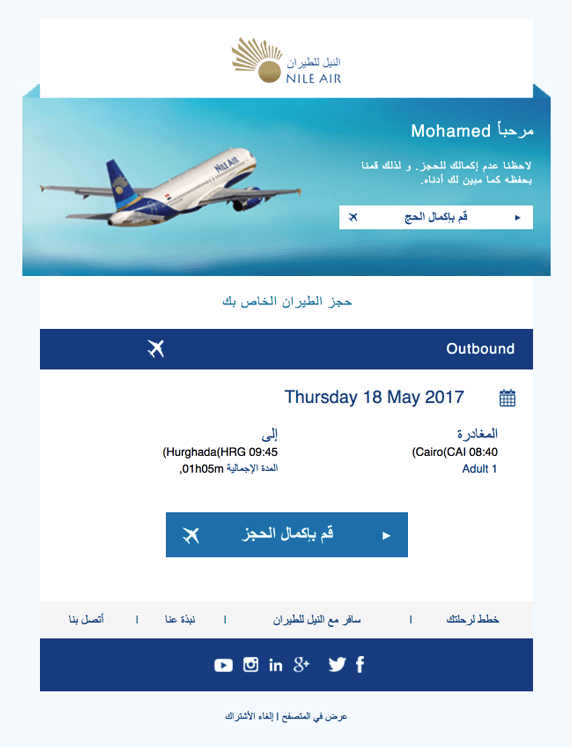 A key element of Nile Air’s campaign is the intelligent on-site remarketing message displayed to customers at the point they abandon. Focused on adding urgency to the booking, the message dynamically displays the number of people currently viewing that specific flight to tempt customers to “Complete your booking below to avoid missing out”. Those not tempted by this on-site message are then sent a fully personalized cart abandonment email, making it as easy as possible for them to pick up their booking where they left off. 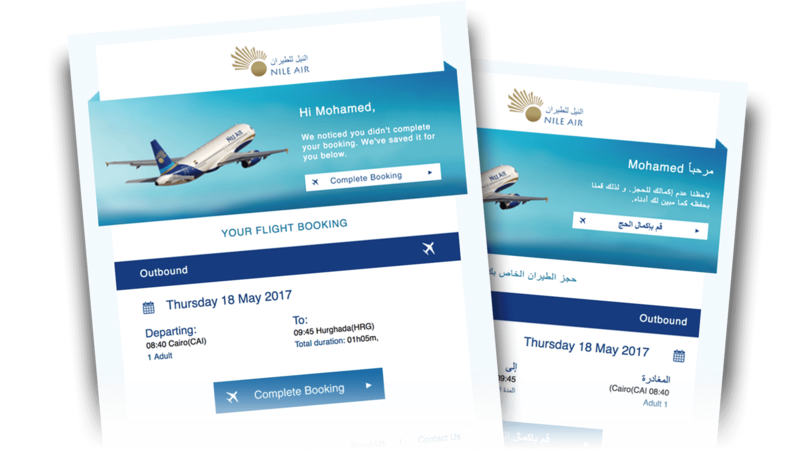 The on-site and email remarketing aspects of the Nile Air campaign have been a huge success, driving an overall increase in online sales of more than 15%. 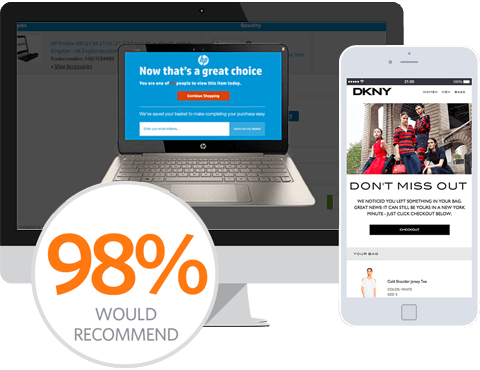 Customers appreciated the timely and relevant nature of the messages with 9% who clicked on the on-site messages going on to purchase. More than 10% of customers responded to remarketing emails, resulting in an average order value of around $320 per email sent. Working with SaleCycle has been fantastic! They’ve helped us tackle booking abandonment – improving customer service and increasing online revenue in the process. The set up was easy, and the continuous support, reporting and account management ensures we’re getting the most from our campaign. On-Site Remarketing	Stop people abandoning. Booking Abandonment Email	International creatives. Make it easy for them to come back. 75% of visitors add something to their shopping cart but then leave your site. Use ‘Email My Basket’ to provide a handy route back when they are ready to buy.